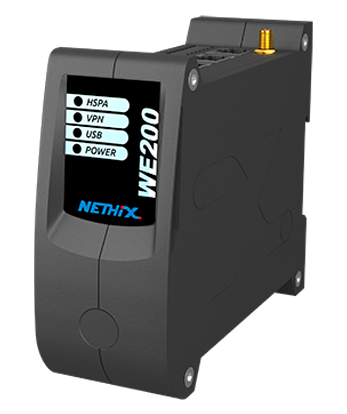 WE200 is a secure feature-rich 3G/LTE industrial gateway solution that allows to remotely access any device or machine through the serial, USB or Ethernet interfaces such as a PLC or HMI for configuration or maintenance purposes. 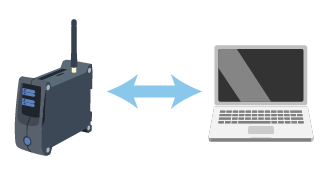 WE200 provides a secure VPN connection between the device or machine and the workstation where the SCADA or HMI software is running. 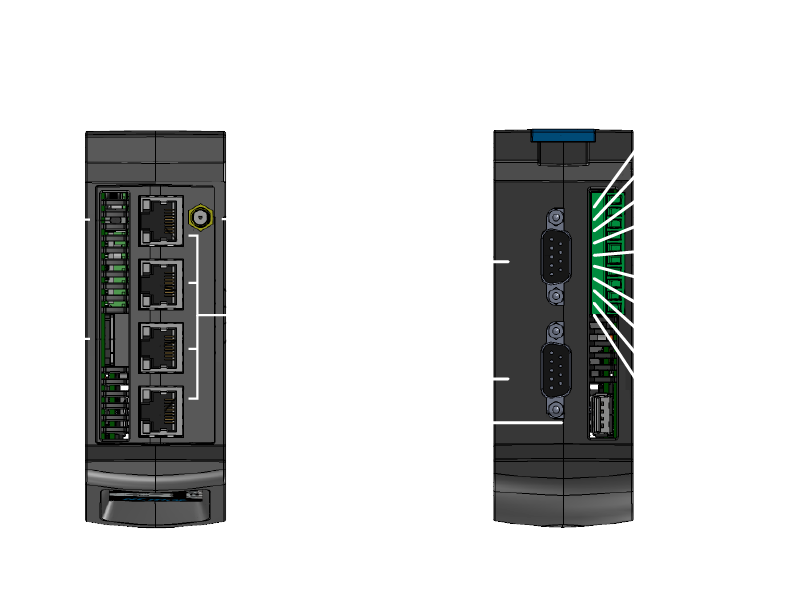 A single WE200 can be used to manage more the one device or machine simultaneously and it is highly compatible with any device or machine that uses an RS232, RS485, USB or TCP/IP serial port, independently of the used protocol. The built-in Web interface allows to easily configure and update the device by using only a standard browser. The digital inputs are not galvanic isolated, they have an internal pull-up and are activated by closing the circuit with GND through a dry contact. Avoid to connect them directly to 230VAC network. This chapter describes the installation procedure and first device start up. If you plan to use the HSPA connection, it is necessary to have a SIM card that allows data traffic. Please check the carrier’s data planning for prices and costs of the service. Verify that the device is installed in a physical position in which it receives sufficient 3G/4G network coverage. The device has been tested and verified with SIM cards of the major European carriers such as Vodafone (Italy), T-Mobile (Germany) and O2 (Ireland). It has also been used with SIM cards of carriers in different parts of the world such as Africa and Asia. However, there is no warranty that it will work with all the existent SIM cards in the market. Please contact Nethix for further information. 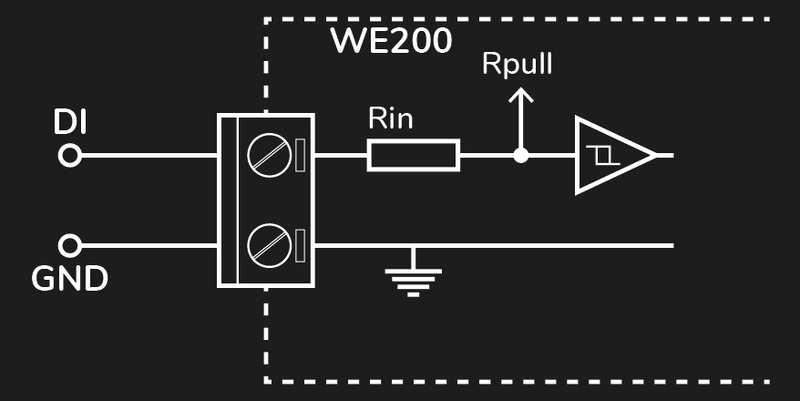 Disable the PIN for the SIM card to be used in WE200, using a standard GSM cell phone. Refer to the phone user manual for details. Insert the SIM card in the WE200 as the image shows. The SIM card contacts must face the pluggable screw terminal and the cut angle faced to the front of the device. Avoid to insert the SIM card when the device is turned on. After turning off the device and removing the power source, the SIM card can be inserted/removed. Mount the WE200 in a DIN bar allowing access to the SIM card and the pluggable screw terminals. Prepare the input and output connections to the pluggable screw terminals as required by the application. 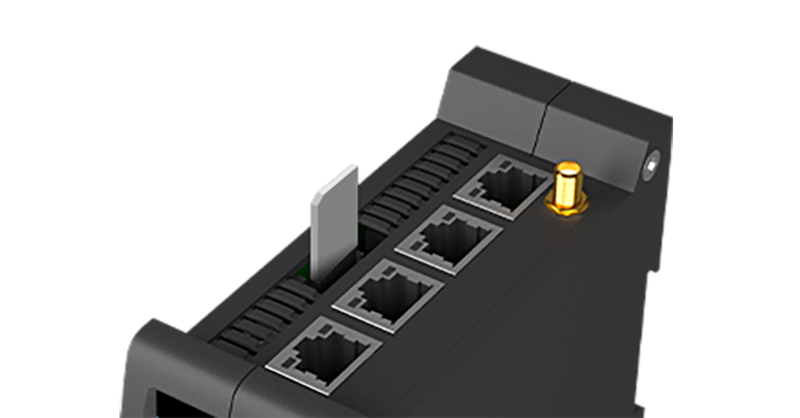 If required, connect the serial and USB ports to the devices to be controlled. Connect a quad band GSM antenna with the right cable and, if required, the extension being sure to have a satisfactory GSM signal. Check the network coverage with any mobile phone. Connect to the pluggable screw terminals the +VIN and GND of the bottom connector to an adequate power source. 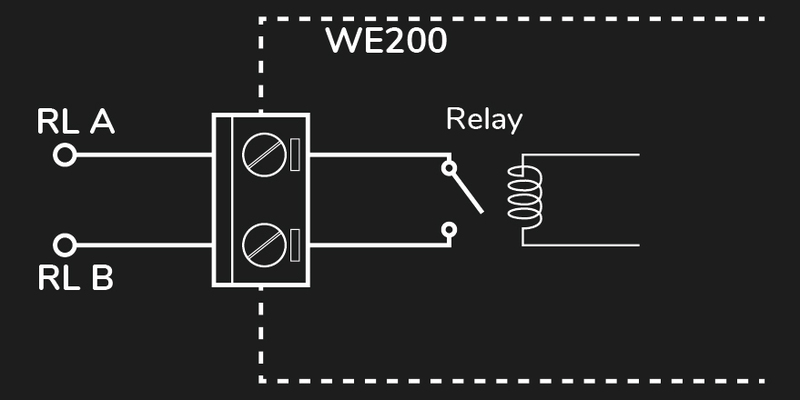 The POWER LED will turn on when the WE200 is connected to the power source. After ~40 seconds, all the application and services will be active and the web interface will be reachable. After ~30 seconds of step 2, if previously enabled, the HSPA/GPRS service will become active and the HSPA LED will turn on. The services that depend on this connection will be active. It’s necessary that the PC belongs to the same subnet of the device. In this case the private network 192.168.1.X. For connecting to the WE200 a standard Internet browser is needed. No drivers or specific software are required. The recommended browsers that were also used for validating the web-interface are Firefox and Chrome. However, other browsers are known to work properly. 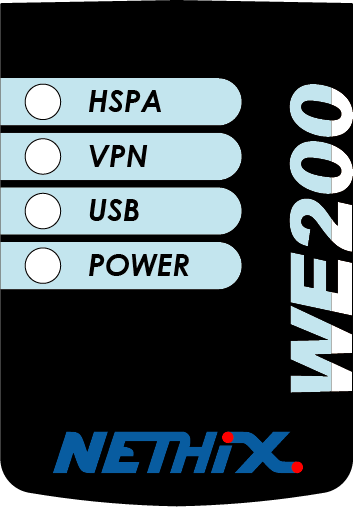 The VPN can use any of the above channels to establish a secure connection between the WE200 and the PC. It needs a client software in the PC and a server that provides the service such as the Nethix Portal. Using the proper icon at the right top of web interface. Only an administrator can power off or reboot the device. Using the Stand-by mode described later. Powering off the device by removing unexpectedly the power source could cause data loss or corruption. The Stand-by functionality turns off all the system applications, such as the web server and the variables monitoring, setting the system to a low power consumption state. This functionality must be always used before removing the power source from the device. Not doing so, could cause data loss or corruption. When the LEDs start blinking together fast, release the button immediately. The POWER LED will turn-on again for several seconds and start blinking again slowly, approximately once every two seconds, indicating that the system has entered the Stand-by mode and that is in a low power consumption state. The whole procedure takes approximately fifteen seconds. Notice that leaving the side button pressed after all LEDs blink three times starts the Network Recovery procedure. When in Stand-by mode, the POWER LED blinks slowly, approximately once every two seconds. Press the side button and leave it pressed. The POWER LED will start blinking fast for approximately three seconds, then it will remain turned-on. At this point the button can be released and the system will start-up normally. After these six seconds, the POWER LED will turn-on and start blinking again slowly, approximately once every two seconds, indicating that the network recovery has been executed and the system is in Stand-by mode. Execute the procedure for leaving the Stand-by mode for booting the device normally. Notice that the Network Recovery procedure is applied only to the Ethernet interface and not to the Wi-Fi or GPRS/HSPA interfaces. Nethix products support SIM cards from providers of all around the world, particularly from Europe Africa and Asia. However, there could be some incompatible SIM cards. The device cannot receive/send SMS if the SIM card is not enabled to GSM services and network or credit is not available (if prepaid card is used). Verify that the device is operated in an area covered by GSM network with sufficient signal strength for granting proper functioning. In case of questions or doubts regarding the cost of the SMS service consult your Network Provider.